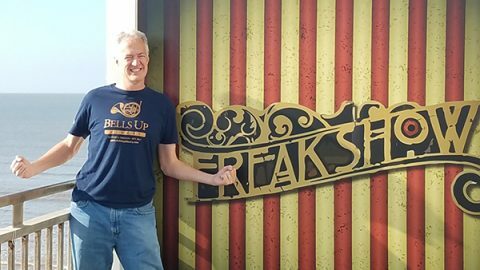 Unlike our spokesmodel and Fanfare Club Founding Member Scott, pictured above, you don’t have to be a wizard to take advantage of the opportunity to order a long- or short-sleeve version of the Official Bells Up Winery t-shirt with a 10% discount through July 31, 2018. Just order by clicking this link and the 10% discount will automatically be applied to your entire purchase. Both shirts are navy blue with the logo printed in a coppery shade of gold. Both versions come in sizes ranging from Small to 5XL. Don’t forget to show us—and everyone else—your brass by wearing Bells Up Winery’s Official Logo T-shirt. Then, tag us @bellsupwinery when you publish your selfie #bellsupmoment on Instagram, Facebook or Twitter for the world to see! 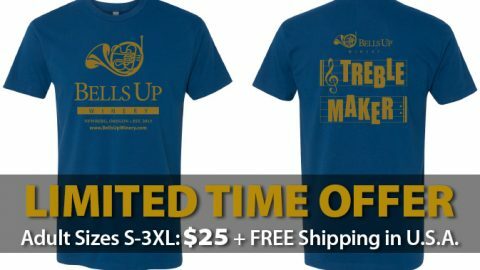 Bells Up T-Shirts: 30% OFF for Cyberweek! We always knew you were a Treble Maker. Now you can tell the world without making a sound. The Fanfare Club t-shirts are here.